Garmin, a well known producer of navigation instrument has surprised us with a watch! It is the Garmin Quatix, their first marine watch intended for any kind of sailor, yachtsman, power boater, dinghy racer or kayaker. It does not seem so strange that Garmin has produced a watch that is equipped with highly accurate GPS system and refers to the first navigating marine GPS watch. Using Garmin Quatix it is possible to load routes and mark waypoints or control the autopilot from your wrist. 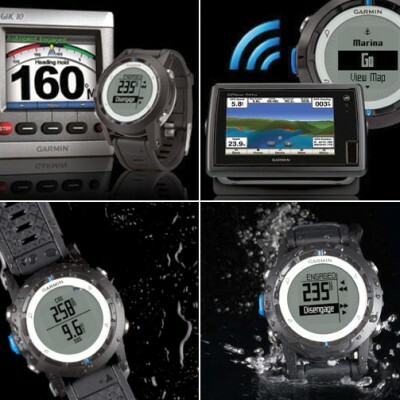 Advanced feature allows you to view wind speed and direction or water depth if Garmin Quatix is paired with device such as Garmin GNT 10 NMEA Transciever, which is sold separately. The use of these two paired devices also provides an automatic Man Over Board alert activation in case that a crewmember wearing Garmin Quatix falls overboard. More experienced seafarers would benefit from built-in barometer and tide tables which cover over 3,400 locations so far, making the route planning a lot easier than so far. As more and more marine procedures and feature of marine devices are transferred to tablets and smartphones, the Garmin Quatix is also compatible with Apple devices using BlueChart mobile application or HomePort marine planning software for Windows and Mac devices. This more-than-just-a-watch device also combines advanced sailing tools such as virtual start line or start countdown timer while tack assist mode provides a skipper an indication whether the vessel is getting headed or lifted, based on the optimal tack angle provided. This product was nominated for 2013 DAME – Design Award METS, the prestigious award of Marine Equipment Trade Show in Amsterdam which took place in November 2013. The jury was impressed by so many features and the range of use in such a small package. Surprisingly, among all its advanced features this watch actually tells time as well. A Yacht Charter Group can help you find a charter yacht and advise you on what to take on your sailing trip. Your sailing trip can be a great way to test everything Quatix can do.